Thanks to a resurgence of interest and a recent proliferation of research techniques, much new and illuminating data has emerged during the last decade relating to the prefrontal cortex, particularly in primates and rodents. 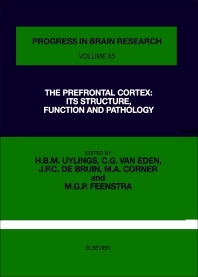 In view of this progress, the 16th International Summer School of Brain Research was held in Amsterdam, The Netherlands from 28 August to 1 September 1989, devoted to the topic of `The Prefrontal Cortex: Its Structure, Function and Pathology'. The edited proceedings, embodied in this 85th volume of `Progress in Brain Research', fall into three sections - the first of which, following two introductory chapters, discusses the present knowledge of the organization of prefrontal cortical systems. In the second section, developmental and plasticity aspects in rodent and human cortex are considered, whilst the third section deals extensively with the functional aspects characteristic for the prefrontal cortex in primates, rats and rabbits. The last section reviews several topics on dysfunction of prefrontal cortex in rat and man, including a historical review on psychosurgery.